WoodMaxx 26" capacity 14 hp. portable sawmill. Bi-metal blades can cut 3-4 times as much timber than standard carbon steel blades but require a bit more power to run, and are a "must have" when sawing hard woods. Bi-metal is similar in composition to a hack saw blade, whereas carbon steel blades are most similar to a carpenters hand saw, and we all know what happens when you run unto a nail with one of those. Additionally, the WoodMaxx SM-26/e is equipped with a 14HP engine when our competitors are happy to sell their 26" capacity mills with only a 9.5HP? Because we want milling to be as easy as possible and reduce maintenance intervals. With the 14HP engine we can utilize a bi-metal blade with a heavy offset of .024" whereas standard offset is .020". A wider offset allows more clearance for the blade to slide through the timber which reduces friction, heat and pitch build-up, and ultimately increases blade life and reduces sharpening intervals. Timber Master TK-B Sterling Saw Blades are made right here in upstate NY by Diamond Saw Works. These bi-metal blades are made with M42 steel cutting teeth. M42 super high-speed steel is a premium cobalt high-speed steel with a chemical composition designed for high hardness and superior hot hardness. M42 exhibits excellent wear resistance, high heat-treated hardness (68 to 70 HRC), and the high cobalt content. Cutting edges on tools made from M42 super high-speed steel stay sharp and hard in heavy-duty and high-production cutting applications. Kohler Command Pro series engines offer maximum power and rugged reliability. Complete with cast iron cylinder bores, overhead valve technology, larger capacity oil and fuel filters, and high-performance spark plugs. Command Pro engines deliver years of nearly service-free operation. Equipped with an Oil Sentry automatic low oil engine shutdown system to prevent damage to the engine if the oil level gets low. Even though Kohler engines are very easy to start, when sawing, you will start and stop the engine many times throughout the day while loading logs or adjusting the saw head height. Additionally, the engine is typically chest high when the saw head is raised to cut a 26" log. Included with this option is the battery and an internal 10 Amp charging system. Save your shoulder! This feature turns on the water blade lubrication when the throttle is engaged and shuts off the flow automatically when the throttle is disengaged. Competing mills require you to manually open and close the valve when sawing, but if you forget to open the valve for even a second, the blade will burn, and if you forget to close the valve, all of the water will run out onto the ground very quickly soaking the working area below the mill. this feature is typically found on much bigger and more expensive mills, but we feel that it should be standard equipment. Although the saw head is very heavy, it is easily raised and lowered with the easy reach mechanical advantage lift mechanism. The crank is designed for simple gauging of lumber thickness. For example, four 360 degree rotations of the handle will move the saw head up or down 5/4" (a very common size). Additionally, the ruler guide is located at eye level so there is no bending down to ready it. Known for their extreme reliability SKF bearings are considered top of the line for any high-speed application where durability is a must. Additionally, these bearings are permanently sealed and require no additional lubrication. The seals on these bearings are superior and are weather tight to prevent water infiltration which greatly increases the longevity of the bearings. Logs of up to 26" diameter can be sawn down to 19" square beams. Milling can produce lumber veneer thin or to 20" x 4" thick or 13-1/2" x 7" thick. Dual log cants (one on each end of the log) allow for securing the log more firmly than tracks with just one center clamp. This feature all but eliminates the log from shifting or rocking abruptly during the cut, which can snap the blade quickly. Mounted to the rear of the sawmill for safety, the 10-liter lubrication tank is translucent so that you can see the water level easily to prevent running out of water half way through the cut. Additionally, it is removable and includes a handle for carrying, which makes it easy to lower the tank to the ground for filling. Competitors use solid tanks that are fixed and fillable only from the front of the mill. With a solid tank, you don't know how much water is left in the tank until it runs dry halfway through the cut. 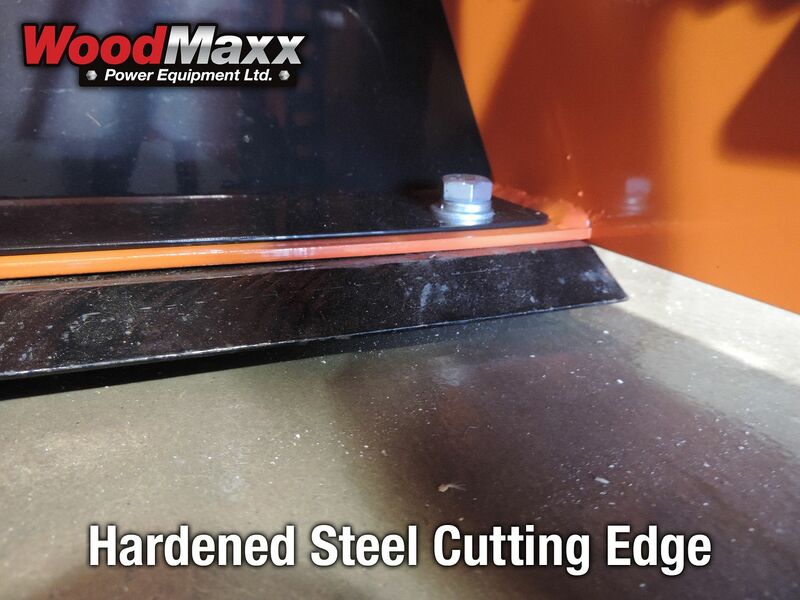 Sawing without lubrication will quickly damage and dull the blade. Simply squeeze the throttle handle and push. 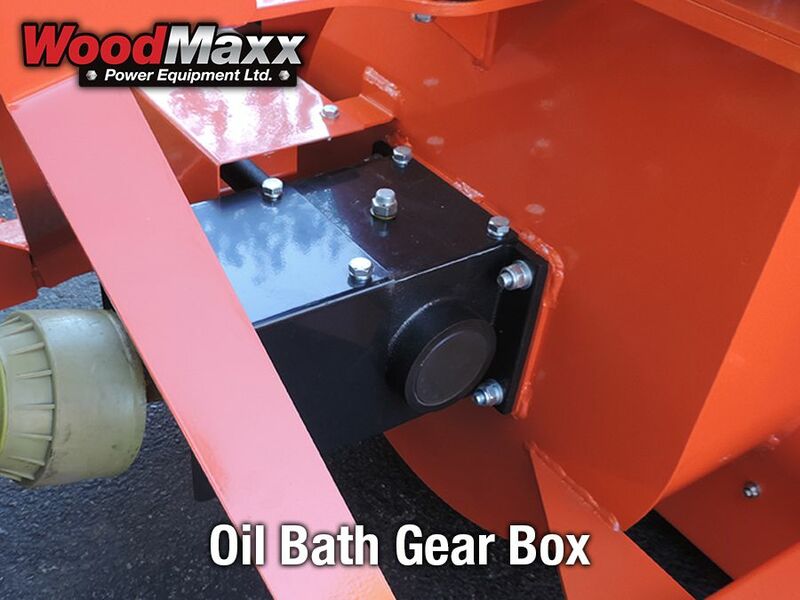 The engine on the WoodMaxx SM-26/e will throttle up to full speed, the water lubrication will flow and the saw carriage will move along the track. It's that easy! No valves to open and no engine throttle levers to adjust. This is the easiest system on the market. The handle allows the user to stand upright and clear to the right side of the mill with both hands on the push bar, competing mills require the operator to push on the carriage with their left hand in a leaning and awkward off-balance stance. The WoodMaxx SM-26/e sawmill is designed to allow for a clear view of the blade by the operator while sawing. The push handle is adjustable to accommodate various size operators. Some mills have complicated structures that infringe on the view of the blade. Safety is paramount, and inevitably there will be a situation where you will need to shut the mill down quickly (such as running the water tank dry, blade binding, etc.) 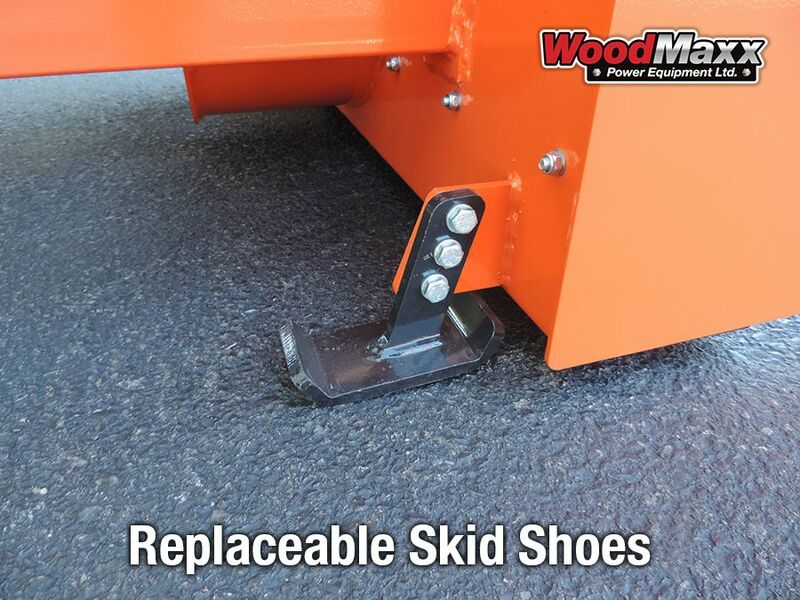 That is why the WoodMaxx SM-26/e mill was designed with safety in mind and includes an easy-to-reach emergency switch that allows the user to stop the engine quickly. The last thing you want to do in an emergency situation is to reach across the mill to stop the engine at the engine switch. Additional safety features include a switch that disables the engine if the wheel covers are open. Adjustable log rest allows for minute adjustments required to saw perfectly square timber with exact 90-degree corners. First off this is my first and only sawmill. Did research on small manual sawmills for about 5-6 months before ordering this one. Went a little above my budget but the money was well spent, especially with all the features on this saw. The longer deck, the auto lube is great, I don't have to remember to turn it on and off every time! But maybe what locked this one in was the electric start option.. didn't want to have to pull that cord all the time. I've had this about a month now and have to say it works as well as I had hoped! It only took part of a day to get it up and running, it cuts nice and square/straight! The motor was a little cold blooded till it broke in, but that's pretty normal with a Kohler. All in all GREAT machine!! I did a lot of research prior to buying the SM-26 and I am happy to say this Sawmill is very impressive. the quality is second to none and the price is a great deal for the product you are buying. Very easy set up, and sawing logs within a couple of hours. and WoodMaxx is a USA Company!! with great customer service reps that speak English.
. Outher then that it seems to work fine. Thanks. Sawmill arrived promptly and packaged well. Set up was simple with a good detailed manual to follow. Having never been around a sawmill before I found this easy to operate after watching the video. So far I am pleased with it's performance. I look forward to spending a couple days cutting as soon as our weather straightens out. Excellent quality/sawmill was easy to assemble and set up well pleased so far.